It's always exciting to break out the lengths of steel and fire up the welders to start in on a new project. For the Trinidad project I decided the first piece would be the horse and wagon. It's similar to the feature we built for Cultus Lake (also the first for that project) but with a definite pirate twist. The design has plenty of fun elements that help tell the story of Skallywag Bay. We start with a sturdy structural framework which is carefully formed with our hydraulic press to fit inside the finished sculpture. We then work our way outwards, first with a lighter subframe and finally with the handformed pencil rod that defines the final shape of the piece. 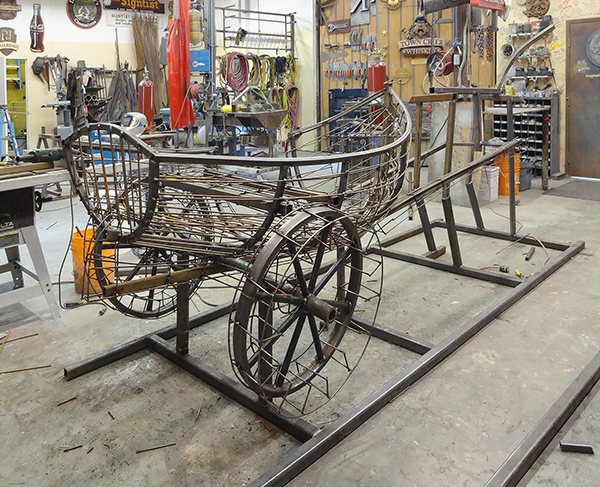 A galvanized mesh will be then tied onto this frame before we can begin the concrete sculpting. Tomorrow the sparks will fly once again.